"I wanted to thank you again for helping to make our company event such a success. I cannot say enough about your professionalism and the courtesies extended to me during the long up and down battle with the changing headcount. You put together a great team and kept all the employees happy the day of the event. Things could not have gone more smoothly. Again, thank you to you and your team, George. "I want to thank you for providing wonderful service. Everything went perfectly. I also want to mention your bartender, Gail. She was so incredibly helpful and just a pleasure to work with. Thanks again. Will definitely let people know of your service." 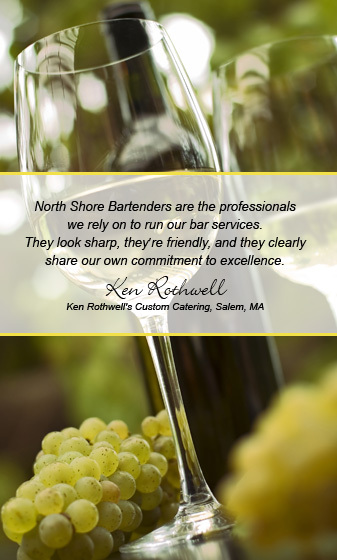 "We want to thank you so much for working with us! The bartenders both did an excellent job and we were more than happy; we had the most beautiful wedding and everything went smoothly, the rain even held off until the event concluded :) Have a great day and we hope to work together again down the road!